We have some new parts in stock from today together with some others that have been out of stock for quite a long time. 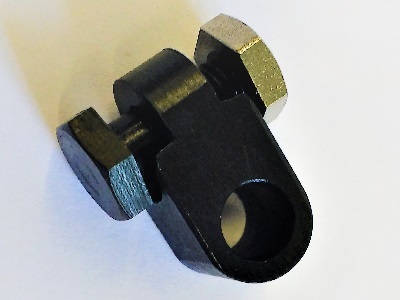 As far as we are aware the B69 Knuckle Joint is not currently available anywhere else. You will see from the long list of restocked parts below that we are work-ing hard to ensure that as many parts as possible are in stock and availa-ble for purchase. Our aim is to reduce to a minimum the dreaded 揌oping to re-order soon� from our Sales List. In practice it抯 a very difficult goal to achieve but we are fortunate that we can call upon the skill and dedica-tion of our Stock Controllers, who specify and source the parts which we can then sell at reasonable cost. Always bearing in mind that they also need to meet VSL抯 quality standards. Velocettes have a deserved reputation for their excellent handling and precise steering. This does of course rely on proper maintenance and VSL can provide the parts you need to overhaul front forks, replace wheel bearings, and so on. I have featured the trunnion shaft and bushes here as I think the swinging arm is sometimes taken for granted but it is important to the handling of the machine and, once upon a time, to the MOT Tester. 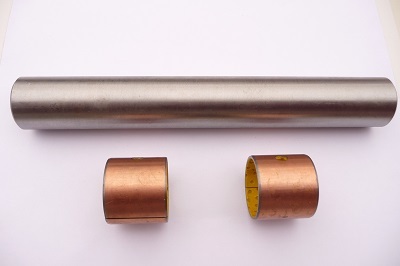 VSL supply the Trunnion Shaft in stainless steel together with the Metal/Acetyl Copolymer type Trunnion Bushes which we believe have advantages over the original metal bushes. The next Open Days at the Old Chapel, Huncote, are on Sunday 7th April and then Sunday 5th May. I抦 told that the January Open Day and East Midlands Bring & Buy were as busy as ever. They are certainly a great start to the year. I wasn抰 rostered to attend this time so I missed out, but there is always such a buzz and a warm and friendly atmosphere at these events that I抦 regretting that I wasn抰 there. The first Alcester Centre ride is usually scheduled for late March and I use this as my deadline for completing any pre riding season maintenance. It抯 usually a very narrow window of opportunity to get the bike ready in time as I have become a complete wimp, working in a cold garage is something I often think I should be doing, but in practise it seldom happens. So, if like me you抮e a fair weather fettler now is the time for action! As ever, VSL can provide the parts you need so please see our Sales List which can be downloaded from our website, or a printed copy can be ordered by post. We process orders on a weekly basis, usually on Wednesday or Thursday, so if we get your order by Tuesday afternoon there is a very good chance you will have your parts for the weekend (UK customers). 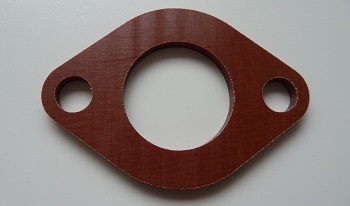 I can recommend VSL抯 range of high quality Tufnol Carburettor Spacers. They are 4mm thick, heat resistant, provide an excellent thermal barrier and are very nicely finished and accurately made in five different sizes to cover most models. Priced at �25 each. N.B. If you are replacing a Veloce original it may contain asbestos so please treat accordingly. The next Open Days at the Old Chapel, Huncote, are on Saturday 9th March and then Sunday 7th April. On behalf of the staff at VSL I would like to wish you all a happy and prosperous New Year. Let抯 hope that we can all look forward to another Summer like the last one. Riding nirvana. Also, this year my Venom will be sixty and I feel this should be celebrated in some way but what do you do? Should I buy it a card, fill the tank with some expensive Shell V-Power 99 Octane petrol, or see if I can persuade the DWP to pay it the state pension? Actually, I抦 going to buy it a present. So, what will it be, a Thruxton head, alloy rims, electric start, well no because VSL doesn抰 sell any of those. So, I抳e decided on exchange brake shoes (VSL103) in the hope that we can both celebrate our birthdays again next year! This seems to be a recurring theme in my Spares News jottings. 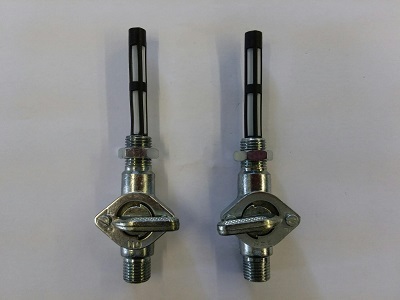 There was an interesting letter from Richard Boldry in FT456 regarding the failure of his Internet bought petrol taps and the time, skill and machine tools required to fix them. I take the opportunity, once more, to expound the virtues of the modestly priced but robust and reliable taps available from VSL at just �80 each. In common with the VOC Membership Secretary we are having difficulty dealing with cheques. We do not intend, at least for now, to refuse to accept them but we intend to apply a minimum value of �. This is necessary because of the high charges imposed by banks to process cheques from businesses and the extra administration incurred by VSL in handling them. If the total value of your order, paid for by cheque, is less than � then we will credit the difference to your account. This means that next time you place an order your existing credit balance will be deducted from your bill. I hope that you will understand our reasons for applying this limit and agree that operating a credit on an account in this way is both fair and equitable. The change will apply from 1st February. The next Open Day at the Old Chapel, Huncote, will take place on Sunday 13th January in conjunction with the East Midlands 態ring & Buy Sale� at the Pavilion. Following that they are on Sunday 10th February and then Saturday 9th March.